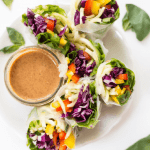 These Curry Chickpea Lettuce Wraps are made with a creamy vegan curry-yogurt dressing and are ready in just 10 minutes. Perfect for the office or as a snack! When I used to go into an office every single day, lunch was always a pain point. 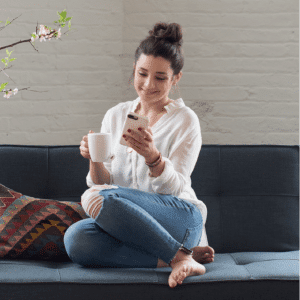 I didn't love leftovers – likely because we were eating a lot of chicken and fish back then and I wasn't a huge fan of reheating those – so I end up just piecing things together, usually not having a proper meal. It would be mixed greens, apples + peanut butter, sometimes a quinoa dish. Not inventive, not exciting and not filling. 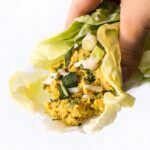 I'm sure many of you are in the same boat, which is why I'm SO excited to share these Smashed Curry Chickpea Lettuce Wraps with you! 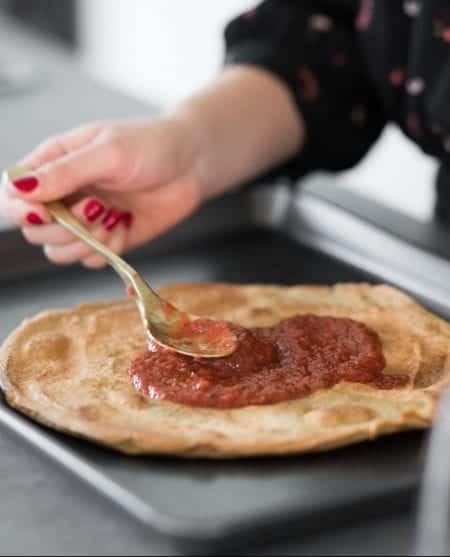 It's the ultimate office lunch and takes only 10 minutes to make! 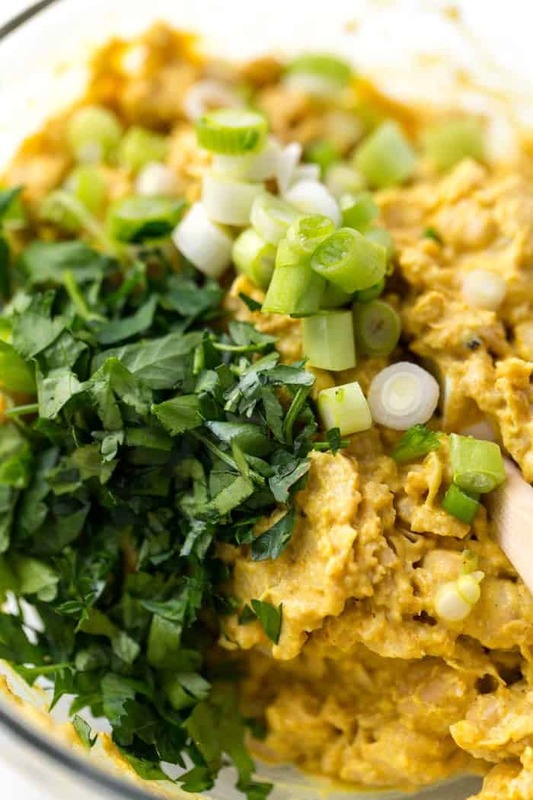 If you aren't familiar with smashed chickpea salad, it's basically a vegetarian version of chicken/tuna salad. It's made my smashing a can of cooked chickpeas and then adding a dressing. 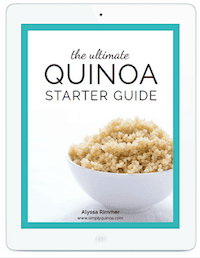 It's simple, it's super nutrient dense and can be used in all sorts of ways. I've shared a few other variations on the blog before (my Avocado + Smashed Chickpea Salad and Caesar Smashed Chickpea Salad), but today's might be my new favorite! 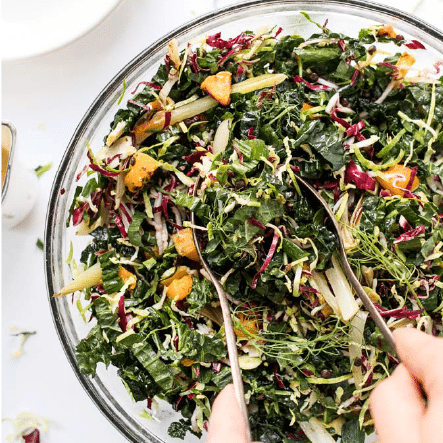 We're serving this salad with a creamy yogurt-curry dressing which is out of this world! It's packed with flavor, it has a very similar texture to a mayo-based sauce, but the yogurt packs in some nice pre and probiotics. 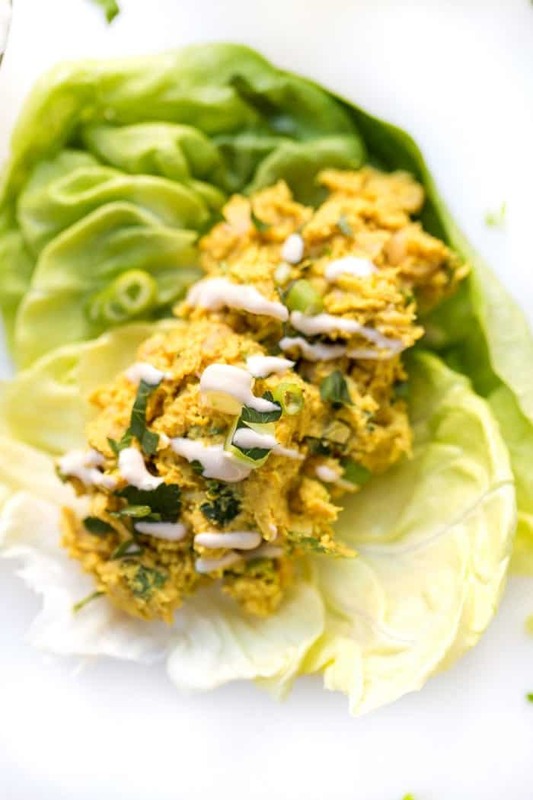 Not to mention healthy fats combined with the insane amount of fiber and protein we're getting from the chickpeas, these Curry Chickpea Lettuce Wraps are definitely a complete (and filling) meal. For some added pop, I stirred in some chopped parsley and sliced green onions. It makes the salad look a little more interesting, but adds flavor and that little crunch factor which is more than welcome. 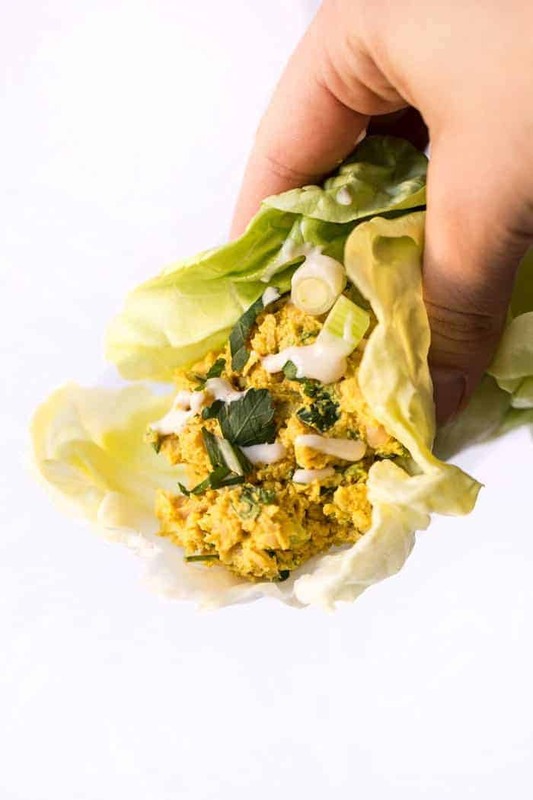 These Curry Chickpea Lettuce Wraps are made with a creamy vegan curry-yogurt dressing and are ready in just 10 minutes. 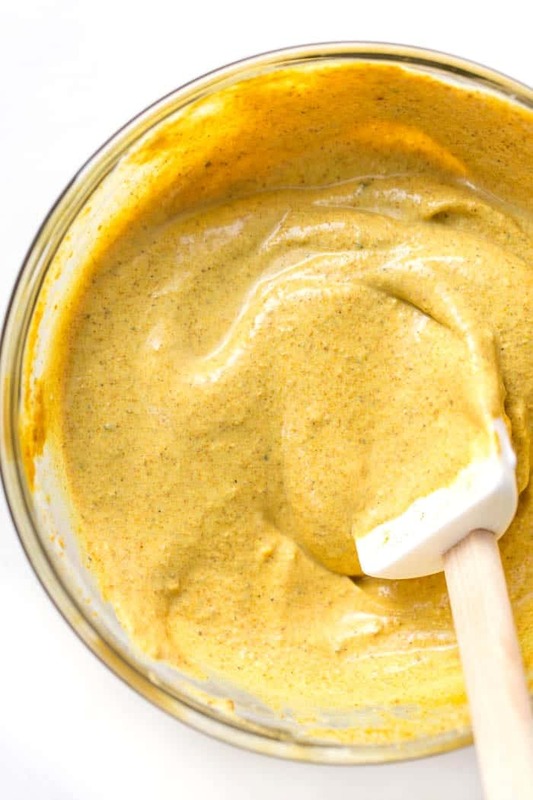 In a small bowl, mix together yogurt, tahini, lemon juice and spices until smooth. Add water 1 tablespoon at a time until the mixture is pourable. 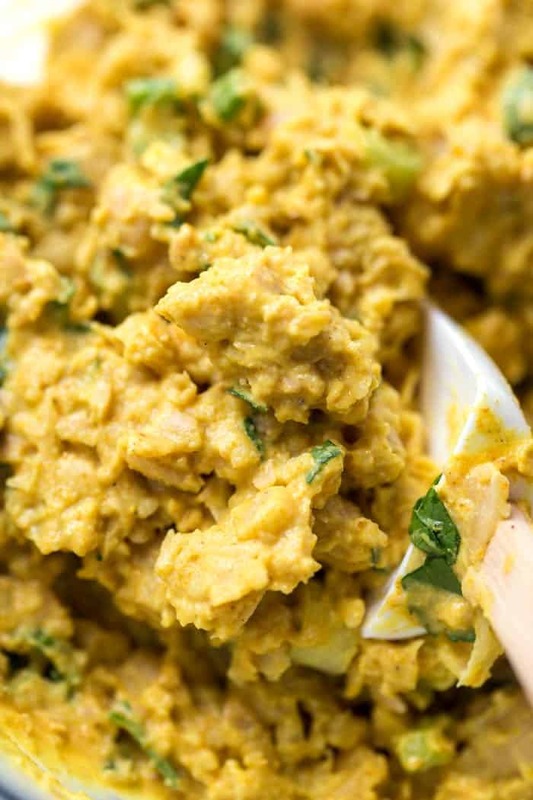 Add chickpeas to a mixing bowl, along with 1 tablespoon of the dressing, and mash them with a fork until most of the chickpeas are crushed. Stir in the remaining dressing, parsley and scallions until combined. Hi, can you tell me how you work out all the nutritional facts for a meal? Is there a software program to help with that?